Cresting the path through the dunes revealed a lot more than just a sea view. Out for a spin in the gap between breakfast and registration the last thing I was expecting to see was an art gallery! But what a fantastic start to the day. A work in progress it would seem. 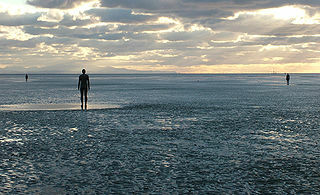 Riding along the promenade towards Southport I passed some of the Antony Gormley figures modelling T-shirts and rucksacks. They probably make great cycle stands too. The windmills along the Mersey look part of the exhibition. I wouldn’t suggest putting one on Glastonbury Tor, but they look clean and gently powerful to me – quite relaxing. And staying over at the Crosby Lakeside Adventure Centre was nice and relaxing too. Checking emails on the lakeside veranda with a San Miguel as the sun went down – working late can be such a chore! This entry was posted in Inclusive Cycling Forum and tagged bikes, conference, disability, liverpool, mobility, wheels4all, words on Fri 13 May 2011 by kevin hickman.